This article is about the figure from Haitian religion. For the figure from films such as "Night of the Living Dead", see Zombie (fictional). For the philosophical concept, see Philosophical zombie. For other uses, see Zombie (disambiguation). A zombie (Haitian Creole: zonbi; North Mbundu: nzumbe) is an animated corpse raised by magical means, such as witchcraft. The term is often figuratively applied to describe a hypnotized person bereft of consciousness and self-awareness, yet ambulant and able to respond to surrounding stimuli. Since the late 19th century, zombies have acquired notable popularity, especially in North American and European folklore. In modern times, the term "zombie" has been applied to an undead being in horror fiction, often drawing from the depiction of zombies in George A. Romero's 1968 film Night of the Living Dead. They have appeared as plot devices in various books, films, television shows, video games and comics. According to the West African tenets of Vodou, a dead person can be revived by a bokor, or sorcerer. Zombies remain under the control of the bokor since they have no will of their own. "Zombi" is also another name of the Vodou snake lwa Damballah Wedo, of Niger–Congo origin; it is akin to the Kikongo word nzambi, which means "god". There also exists within the West African Vodun tradition the zombi astral, which is a part of the human soul that is captured by a bokor and used to enhance the bokor's power. The zombi astral is typically kept inside a bottle which the bokor can sell to clients for luck, healing or business success. It is believed that after a time God will take the soul back and so the zombi is a temporary spiritual entity. It is also said in vodou legend, that feeding a zombie salt will make it return to the grave. The idea of zombies is present in some South African cultures. In some communities it is believed that a dead person can be turned into a zombie by a small child. It is said that the spell can be broken by a powerful enough sangoma. It is also believed in some areas of South Africa that witches can turn a person into a zombie by killing and possessing the victim's body in order to force it into slave labor. After rail lines were built to transport migrant workers, stories emerged about "witch trains". These trains appeared ordinary, but were staffed by zombie workers controlled by a witch. The trains would abduct a person boarding at night, and the person would then either be turned into a zombie worker, or beaten and thrown from the train a distance away from the original location. In 1937, while researching folklore in Haiti, Zora Neale Hurston encountered the case of a woman who appeared in a village, and a family claimed she was Felicia Felix-Mentor, a relative who had died and been buried in 1907 at the age of 29. However, the woman had been examined by a doctor, who found on X-ray that she did not have the leg fracture that Felix-Mentor was known to have had. Hurston pursued rumors that the affected persons were given a powerful psychoactive drug, but she was unable to locate individuals willing to offer much information. She wrote: "What is more, if science ever gets to the bottom of Voodoo in Haiti and Africa, it will be found that some important medical secrets, still unknown to medical science, give it its power, rather than gestures of ceremony." The process described by Davis was an initial state of deathlike suspended animation, followed by re-awakening — typically after being buried — into a psychotic state. The psychosis induced by the drug and psychological trauma was hypothesised by Davis to reinforce culturally learned beliefs and to cause the individual to reconstruct their identity as that of a zombie, since they "knew" they were dead, and had no other role to play in the Haitian society. Societal reinforcement of the belief was hypothesized by Davis to confirm for the zombie individual the zombie state, and such individuals were known to hang around in graveyards, exhibiting attitudes of low affect. Davis's claim has been criticized, particularly the suggestion that Haitian witch doctors can keep "zombies" in a state of pharmacologically induced trance for many years. Symptoms of TTX poisoning range from numbness and nausea to paralysis — particularly of the muscles of the diaphragm — unconsciousness, and death, but do not include a stiffened gait or a deathlike trance. According to psychologist Terence Hines, the scientific community dismisses tetrodotoxin as the cause of this state, and Davis' assessment of the nature of the reports of Haitian zombies is viewed as overly credulous. Scottish psychiatrist R. D. Laing highlighted the link between social and cultural expectations and compulsion, in the context of schizophrenia and other mental illness, suggesting that schizogenesis may account for some of the psychological aspects of zombification. Slaves brought to Haiti in the 17th and 18th centuries, believed that when they died, Baron Samedi would gather them from their grave to bring them to heaven, unless they had offended him in some way, such as committing suicide, in which case they'd be forever a slave after death, as a zombie. 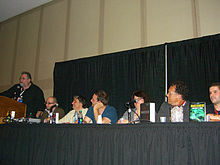 Zombie panel discussion at the 2012 New York Comic Con featuring writers who have worked in the genre (l-r): Jonathan Maberry, Daniel Kraus, Stefan Petrucha, Will Hill, Rachel Caine, Chase Novak and Christopher Krovatin. Also present but not visible in the photo was Barry Lyga. The figure of the zombie has appeared several times in fantasy themed fiction and entertainment, as early as the 1929 novel The Magic Island by William Seabrook. Time claimed that the book "introduced 'zombi' into U.S. speech". In 1932, Victor Halperin directed White Zombie, a horror film starring Bela Lugosi. This film, capitalizing on the same voodoo zombie themes as Seabrook's book of three years prior, is often regarded as the first legitimate zombie film, and introduced the word "zombie" to the wider world. Other zombie-themed films include Val Lewton's I Walked With a Zombie (1943) and Wes Craven's The Serpent and the Rainbow, (1988) a heavily fictionalized account of Wade Davis' book. The DC comics character Solomon Grundy, a villain who first appeared in a 1944 Green Lantern story, is one of the earliest depictions of a zombie in the comics medium. In 2011, Image Comics released a four issue miniseries entitled Drums, by writer El Torres and artist Abe Hernando. The story consists of Afro-Caribbean zombies that have been created using voodoo. The zombie also appears as a metaphor in protest songs, symbolizing mindless adherence to authority, particularly in law enforcement and the armed forces. Well-known examples include Fela Kuti's 1976 album Zombie, and The Cranberries' 1994 single "Zombie". A new version of the zombie, distinct from that described in Haitian religion, has also emerged in popular culture in recent decades. This "zombie" is taken largely from George A. Romero's seminal film The Night of the Living Dead, which was in turn partly inspired by Richard Matheson's 1954 novel I Am Legend. The word zombie is not used in Night of the Living Dead, but was applied later by fans. The monsters in the film and its sequels, such as Dawn of the Dead and Day of the Dead, as well as its many inspired works, such as Return of the Living Dead and Zombi 2, are usually hungry for human flesh although Return of the Living Dead introduced the popular concept of zombies eating brains. Sometimes they are victims of a fictional pandemic illness causing the dead to reanimate or the living to behave this way, but often no cause is given in the story. Although this modern monster bears some superficial resemblance to the Haitian zombie tradition, its links to such folklore are unclear, and many consider George A. Romero to be the progenitor of this creature. Zombie fiction is now a sizeable sub-genre of horror, usually describing a breakdown of civilization occurring when most of the population become flesh-eating zombies — a zombie apocalypse. ^ "Zombie". Oxford English Dictionary. Oxford University Press. 1998. ^ a b Deborah Christie, Sarah Juliet Lauro, ed. (2011). Better Off Dead: The Evolution of the Zombie as Post-Human. Fordham Univ Press. p. 169. ISBN 0-8232-3447-9, 9780823234479. ^ Smith, Neil (7 March 2008). "Zombie maestro lays down the lore". London: BBC News. Retrieved 1 October 2009. ^ Marinovich, Greg; Silva Joao (2000). The Bang-Bang Club Snapshots from a Hidden War. William Heinemann. p. 84. ISBN 0-434-00733-1. ^ Marinovich, Greg; Silva Joao (2000). The Bang-Bang Club Snapshots from a Hidden War. William Heinemann. p. 98. ISBN 0-434-00733-1. ^ a b Niehaus, Isak (June 2005). "Witches and Zombies of the South African Lowveld: Discourse, Accusations and Subjective Reality". The Journal of the Royal Anthropological Institute 11 (2): 197–198. ^ Hurston, Zora Neale. Dust Tracks on a Road. 2nd Ed. (1942: Urbana: University of Illinois Press, 1984, p. 205). ^ Davis, Wade (1988), Passage of Darkness: The Ethnobiology of the Haitian Zombie, University of North Carolina Press, pp 115-116. ^ Booth, W. (1988), "Voodoo Science", Science, 240: 274–277. ^ Hines, Terence; "Zombies and Tetrodotoxin"; Skeptical Inquirer; May/June 2008; Volume 32, Issue 3; Pages 60–62. ^ Oswald, Hans Peter (2009 (84 pages)). Vodoo. BoD – Books on Demand. p. 39. ISBN 3-8370-5904-9. ^ Wilentz, Amy (2012-10-26). "A Zombie Is a Slave Forever". Haiti: NYTimes.com. Retrieved 2012-10-31. ^ "Mumble-Jumble", Time, 9 September 1940. ^ Roberts, Lee. "White Zombie is regarded as the first zombie film", November 2006. ^ J.C. Maçek III (2012-06-15). "The Zombification Family Tree: Legacy of the Living Dead". PopMatters. ^ a b Stokes, Jasie. "Ghouls, Hell and Transcendence: The Zombie in Popular Culture from "Night of the Living Dead" to "Shaun of the Dead"". Bringham Young University. Retrieved 2012-07-25. ^ Savage, Annaliza (15 June 2010). "'Godfather of the Dead' George A. Romero Talks Zombies". Wired. Retrieved 2 October 2011. ^ Deborah Christie, Sarah Juliet Lauro, ed. (2011). Better Off Dead: The Evolution of the Zombie as Post-Human. Fordham Univ Press. p. 169. ISBN 9780823234479. Moreman, Christopher M., and Cory James Rushton (editors) (2011) Race, Oppression and the Zombie: Essays on Cross-Cultural Appropriations of the Caribbean Tradition. McFarland. ISBN 978-0-7864-5911-7. Moreman, Christopher M., and Cory James Rushton (editors) (2011) Zombies Are Us: Essays on the Humanity of the Walking Dead. McFarland. ISBN 978-0-7864-5912-4. This page was last modified on 30 September 2013 at 05:24.